One-way streets, one-way systems and roads will likely be a part of the driving test if available, although this depends on where the test centre is located. The driving examiner will want to ensure you cover as many road variations as possible within the 40 minute driving test – one-way systems and streets being no exception. Predominantly this depends on whether one-way systems and streets are close enough to your chosen driving test centre to be incorporated into the driving test routes. 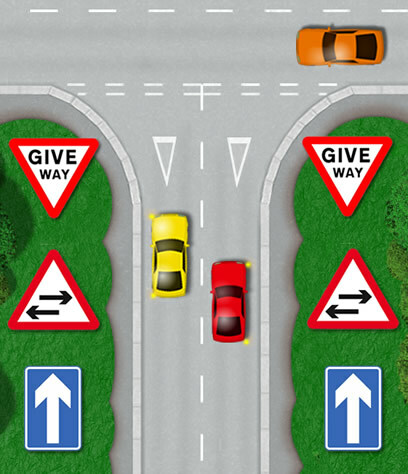 This tutorial explains one-way systems / street rules, how to locate them and how to correctly deal with them whilst joining and whilst driving within them. During a driving test, the examiner will not try and trick you into driving up a one-way street in the wrong direction. They may however say something along the lines of ‘take the next available left’ and if the next road on the left is a one-way road with no entry from your direction, you will need to be sure what you are doing. Remain vigilant for all road signs whilst driving and in the case of one-way streets, no left or right turn signs. 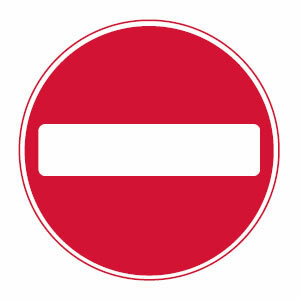 Red circular road signs or circular signs with a red ring indicate a prohibition. A one-way road will usually have a no left or no right turn sign placed a short distance before the junction to inform motorists. On the junction itself, there will be a no entry road sign as illustrated in the images above. Let’s assume you are now driving on a one-way street in the correct direction. It may not always be too easy to tell if you are on a one-way road, blue rectangular one way traffic signs will be placed at the beginning of the road and at intervals along the way to inform motorists that the road is one way. Road signs will inform you of what happens at the end of the one-way road. Often a one-way road will end, giving way to road with two-way traffic. You may see an ahead only road sign. Though this looks similar to a one-way traffic sign, it has a very different meaning. For example, you could be at a junction that states ahead only (no turning left / right), but it could be on a two-way street. 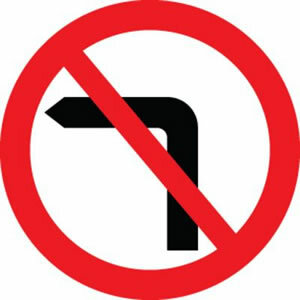 This is a mandatory sign, where if you were to make a left or right turn, you could be driving into a one-way street, against the flow of traffic. 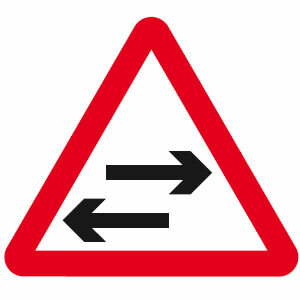 One-way T-junctions as illustrated in the diagram often have two lanes that merge into a two-way road. It’s important to select the correct lane. If you are turning right you will need to select the right lane. If during a driving test you struggle to get into the correct lane due to either leaving it too late or due to high levels of traffic, remain in your current lane. One-way systems can present a confusing challenge to not only learner drivers, but experienced drivers alike. They can often comprise of multiple lanes. During a driving test, the examiner will either tell you which lane they would like you to take, or ask you to ‘follow the signs for’ – leaving it for you to decide which lane is appropriate. Many driving tests are failed on one-way systems due to learner drivers using the incorrect lane, realising they are in the incorrect lane and accessing the correct lane unsafely. Driving tests are not failed due to using the incorrect lane providing it is legal and safe. If you find yourself in the wrong lane, try and access the correct lane only if it is safe and legal to do so. You will need to use the Mirror Signal Manoeuvre (MSM) routine and check the blind spot before changing lanes. Check road markings also as solid continuous white lines do not permit crossing. If you cannot access the correct lane, remain in your current lane and the examiner will take you on an alternative route. One-way road markings are often placed on one-way roads and systems, especially those with high traffic. They are used as another visual aid alongside signs. Get in lane in good time as leaving it too late may prevent you from gaining access to the correct lane. Busy one-way systems will involve a great deal of observation and anticipation and planning. You will need to safely use the correct lanes but you will also need to deal with cyclists and pedestrians. Pedestrian crossings are often located on one-way systems. Lane straddling is when a motorist does not keep within the line confines of their own lane. This can be dangerous as it can risk a collision with another vehicle or cyclist if the driver is unaware what they are doing. For further information, see lane straddling. Lane straddling is often seen at one-way systems, especially at complex systems. Straddling lanes is highly likely to fail a driving test if done either excessively or significantly. See lane discipline for further help. At one-way systems, junctions and roundabouts, be aware of large vehicles. Large vehicles often need to straddle lanes as they need to extra space for turning. Give large vehicles extra room in such situations. You are legally permitted to overtake one the left on a one way street. before you realised you are on a one way what do you do in this situation? Depends on the situation. You will of course need to immediately stop and turn your vehicle around if safe to do so. If it’s not safe to do so, the only option would be to inform the police where they would have to temporarily stop traffic. 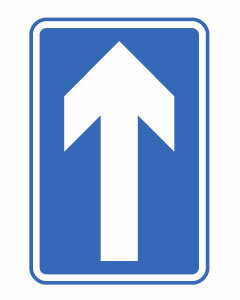 The one-way sign is the blue one with the arrow. The other sign you are referring to, does it have a large white arrow with a smaller red arrow? If so, this is a priority sign. Hello and thanks alot for your useful website. 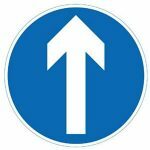 what is different between one way road & one way street signs? Do you mean an ahead only sign and a one-way traffic sign? I have updated the page to explain that. If you are on a one way street and you approach a green light and want to make a left do you have to stop if there is no on coming traffic or can you just make the turn? If you do not have priority, but there are no oncoming vehicles, then you can just make the turn. May I ask a question about how to correctly give Indication/Signal in relation to one way system please? Thank you. One example – When emerging out of a One-Way Street to a T-junction where traffic light controls are in place. 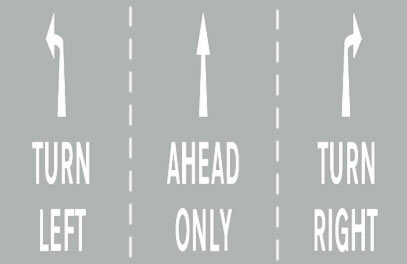 You get in the correct lane to turn left, can you omit the Indication/Signal to the left just because your position shows that the only way you can turn is turning to the left? 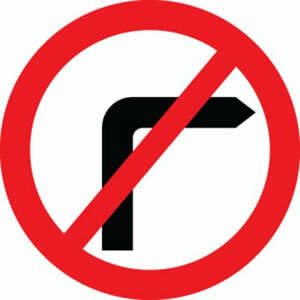 Another example – When at a T-junction with sign shows no right turn, you are turning left. If you indicate and signal to the left, is it very wrong? Yes you can omit the signal when in a dedicated lane. However, providing your signal does not cause any confusion, it’s usually best to signal regardless just to ensure other road users know your intent. The same applies to your second example, no need to signal but if you are signaling and providing it doesn’t cause any confusion, then there is not an issue. a. You should reverse back to a minor road. b. Take a U turn and drive back. c. Continue till u get a exit. The DVSA / theory test does of course recommend that you continue to the end of the road, though I would think in reality, most drivers would probably try to turn their vehicle around. Hi, I have a question about the one way square, which looks very much like a mini roundabout. 1. If I need to turn left at the end of the circle, should I bear left and signal left when approaching the left exit? 2. If I turn right at the end of the circle, should I bear right and signal right before the exit? It really depends on the situation that you’re currently in and the road layout. If there are dedicated lanes for turning left and one for turning right and you are already in the correct lane for taking the exit that you want, then you do not need to indicate. If you are in the incorrect lane and need to change, then you will need to indicate for the lane change (not the exit). If there are no dedicated lanes, then you should indicate so that other road users know your intentions. Yes, if you’re in a one-way street, you should keep to the side of the road in which your exit is. if a vehicle pulls out of a driveway onto a one way street somewhere in the middle of the street, so there is no visible signage, and drives the wrong way, and another vehicle accidentally backs into that car as it suddenly appears travelling the wrong way. Which vehicle would be at fault? Car accidents and driver blame isn’t always quite as obvious as it appears. It may be clear to blame the driver going the wrong way down the street, but if there’s ineffective signage, this might be another cause of blame. There would also be questions as to why the other driver (going the correct way) didn’t manage to avoid the collision. So you see, it can get quite complex.